1. 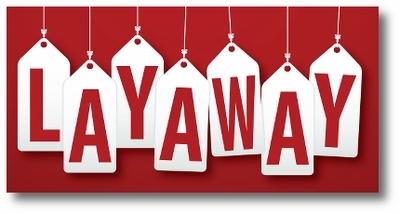 Type "LAYAWAY" in the comments section during checkout. 2. We will charge your credit card 1/3 of the total of your order, followed by 1/3 each for the following two months. 3. Your order will ship immediately following receipt of your 3rd payment. Feel free to request a longer payment (up to 12 months) in the comments section! For online orders paid for with PayPal, we will refund all but your first payment back to your PayPal account when we confirm your order. In subsequent months, we'll send you PayPal money requests for the monthly payment due. BUY NOW --- PAY OVER TIME --- IT'S SIMPLE!